A more accurate title: Homeschool your kids into a fundamentalist enclave and get them into the workforce ASAP.Where do I begin? I hate to knock these people since about half of what they say makes sense. Yes, you should encourage your kids to learn about what interests them, and be involved, and have family activities. That's all good. Where they go off the rails IMO is the denigrating public schools ("because the movie Waiting for Superman! "), the Bible-thumping-bordering-on-biblidolatry, and clueless reliance on their privilege ("all you need to do is have Dad telecommute six hours a day and have mom stay at home, no problem to raise & home-school 10 kids on one income"). Calling public education an intractable problem and pointing to one seriously problematic "documentary" that was bankrolled by charter school advocates is pretty lame. The batshit fundamentalism taken for granted (intelligent design, Biblical numerology, etc.) certainly raised my eyebrows. But the fact that they are not actually offering any reproducible "method" so much as explaining how they got their home-schooled kids into extremely conservative evangelical universities, makes this book misleading at best, dishonest at worst.Good for them and in all fairness they recognize that this doesn't mean they raised a family of geniuses (though if the writing samples from their kids that are included in the book are really their unedited work, they are very, very articulate). Why exactly rushing your kids through their education is such a good thing is not addressed very well. The Hardings evidently believe that an education is strictly for finding a job, and their plan gets the kids into the workforce as quickly as possible, so on that level their plan is working. I suppose I'm just a curmudgeon and throwback for thinking that an education has intrinsic value and should not be rushed. If you think, as the Hardings evidently do, that all the important questions and answers in life are settled by the Bible, I guess there is not much need for education as a way to discover one's potential, improve oneself as a person, or seek the true, the good & the beautiful. *Full disclosure I got a copy of this book for free through the Goodreads "first reads" program. * I would not have bothered with this book if the publisher's description had been more accurate. When I saw this title and read its description, I knew I wanted to read it to see the process of how their homeschool worked. The book begins with Mona and Kip presenting multiple valid reasons why they decided to homeschool, introducing their children and talking about the results they have achieved. The results are impressive in regard to their children's achievements. However, I found this book to be more of a "look at the good job we are doing" rather than a book giving advice on the process of homeschooling. The advice Mona and Kip provide are helpful, but very vague. For more practical advice, you would want to consult The Well-trained mind: a guide to classical education at home by Jessie Wise and Susan Bauer or books of this type. Read to get inspired and then dig into the options that work for you! Where are we and what year is this? The Christian fundamentalism in this book would make the Pope cringe. If you can get past that, there isn't much here other than ways to capitalize on college admission loopholes. If the Duggars were serious about academic credentials....Then they'd be the Brainy Bunch. I think my first sentence will say it all to many of you, and to the truly curious, keep reading.While reading this insufferable book, it's easy to get caught up in all the things they do "wrong." The truth is that this book was made available for the same reason you're reading this review: The Hardings have done a lot of things "right." In fact, they're the apotheosis of good parents. For this reason, I don't want to dwell on the too-numerous-to-count ways that they fall short as parents, as authors, and as educators. You can get an idea of those things by reading all the other reviews.Unfortunately, this newly released Simon & Schuster book is simply below par. It's unfortunate because they had plenty of feedback on their e-book that they could have corrected in this more official work. It's below par because it wasn't written well, wasn't organized well, and left their most enthusiastic readers in the dark wondering. My opinion is that they simply weren't capable of penning a top quality book. This truth should come to some relief to many parents out there. You do not need to be an intellectual, in any sense of the word, to produce results in your home that would win you national awards if replicated in a classroom.I think that should be your take-away from this book. These parents have hearts the size of Texas and brains the size of Rhode Island, and yet they absolutely destroy the norms of educational achievement in the USA (I think that heart the size of Texas has a large part to do with it). If they can do it, you can do it. By "do it," I don't necessarily mean getting your child a degree before 18 years; I mean you can bypass the Moskvich education that the proles take comfort in and give your child a more distinguished education yourself (A Lexus perhaps? ).Quoting page 191 of the hardback version:"If able, homeschool - not even the most prestigious private school can give you results like this"No argument there. "Start teaching your kids to read at ages four or five. "I take issue with this bit of advice. Oh sure, you've heard the John Holts of the world tell you to leave your child fallow for up to a decade, but I'm here to tell you this advice is severely misplaced. The most opportune time to teach your child to read is... wait for it... when they're acquiring the language in the first place. Yes, that means from ages 6 to 36 months (and likely completed well before that 36 months).I realize I'm front-running the research on this by probably a decade or more. Just take my word for it. I have no reason to steer you wrong. I appreciate the outside-the-box thinking the Hardings present. Unfortunately, this book struggled in so many ways. Did the first draft make its way to the publisher? The lack of organization and sense of purpose within each chapter irritated me at every turn. In addition, it failed on claiming an overall aim for the book: memoir / how-to / memoir / tangents. It felt all over the place. I did not expect detailed instructions for their "method", but I'm shocked to find such a rough sketch of what they did use. I think the Hardings have great ideas and would have benefited tremendously from an assertive editor. * They seem so sweet. It killed me to find To Train Up a Child and Created to Be His Help Meet as recommended reading in the appendix. The Pearls make me sick. This is far less a book about homeschooling and much more the story of a large Christian family that homeschools the children in order to separate them from the many undesirable qualities and practices they associated with schools both public and private, including Christian. Unfortuntately, this book is distractingly disconnected and will be of less practical use to families currently or considering homeschooling than any of the better websites. At best it can serve as an affirmation for Christian families that they are making the right choice. The Hardings outline their reasons for homeschooling and include their children’s essays about their experience, but they are merely redundant "folksy" reiterations of the mom’s statements. While many may take issue with the attitude, “What matters most is that they can do the college-level work when they get there, not that you have to be creative in making a high school transcript” (53), the practice of earning college credits while still in high school is laudable and quite common among homeschoolers (and public high schools). On the other hand, the Hardings assert that they merely accelerate their children as appropriate, but they zoom through material. In some ways, the Hardings have homeschooled in the worst possible system, utilizing boxed curriculum that “literally comes to you in a box in the mail….Once your child is finished reading all of the workbooks and taking the quizzes and tests in the back…the child is done.” In crafting transcript entries for more advanced work, “Once they have worked through one college textbook, we are satisfied that they have earned high school credit for that course….As long as there is learning going on, we count it” (pp 48-9). The Hardings also “teach to the test” (SAT/ACT) for college admission (at age 10) and reject extra-curricular activities that are not on the college level (p 154).These are practices that mirror precisely what most of us decry about public schools. They are simply appalling and certainly do not reflect the highly engaged learning experiences that many dedicated homeschooling families develop with their children. It is as though academically they are merely churning their children through to college while providing a loving family experience on the upside.Lastly, readers who are not this type of fundamentalist Christian will likely be offended by this book. “Without the faith ingredient, your child may be as smart as they come but still be as unwise, foolish and possibly evil as can be” (p. 25). Ouch.There are so many criticisms to make about this book, which could have benefited greatly from a ghostwriter with homeschooling experience as well as a thorough review by an editor. It smacks of a rush job. Research is entirely lacking. There is far better information on homeschooling out there in books [ie Bauer], websites, and discussion groups. Look elsewhere. I won this book in a Goodreads Giveaway and was happily pleased with it. I'm new to the Home School world so I was interested in how this family has approached it. I like how the author/s were honest with their mistakes and successes. With a faith base, they look at education as a journey that isn't tied to schedules, tests, and homework. Going through a typical family day, they use teachable moments at the dinner table, car trips, and more. I like how they don't hesitate to encourage each child's ambition in life. They use their likes in their daily schooling. Being a librarian, I appreciated they mention of now your local library can aide you with materials in your home school curriculum. I can see home school families really enjoying this book. It'll show them the decision to home school is a safe one, a good one, and the rewards are worth all the effort. I read this because I was curious about how this family sends their kids to college by age 12. Somehow I got through the insane Christian fundamentalism and repetitiveness of this book and found a few interesting ideas. I like the idea of nurturing your kid's interests and letting them work at their own pace. It makes me think that if you let your kids work toward their dreams at an earlier age, rather than being forced to pursue subjects that don't interest them, they are less likely to abandon their goals. But having self-motivated kids is easier said than done. I would probably never be able to homeschool my kids, but their methods aren't that crazy- as long as you remove the heavy religious indoctrination and general paranoia about society and government. The parents writing this book make it seem so easy. All you have to do is give birth and the kids will,love to read. I would like to know what they would do if their kids hated reading. No. I homeschool my ordinary kid and he does not like to read. I did everything I could to get him to like to read and he doesn't. He also doesn't like coloring or writing. Nope it is not that easy unless your kid likes to read. This book gave a useful perspective into this family's approach to homeschool. They seem like a great family, dedicated to loving each other and doing good in the world. I especially appreciated their thoughts about believing in your child's abilities and feeding their natural curiosity. And they showed that homeschool is really doable. This book is a useful, interesting, inspiring resource for homeschoolers and parents in general.The Hardings shared a lot of their beliefs and values throughout the book. I didn't have a problem with that at all. Their religion obviously played a huge part in their homeschool, and I think that's cool. STOP NOW IF YOU DON'T WANT TO READ A THEOLOGICAL DISCOURSE!But as I've waded into the homeschool community, I've come across one specific belief again and again. The belief is that good Christian wives need to submit to their husbands. That the husband gets the final say for the family. This belief came out in small ways throughout the book such as when Mona Lisa said, "I needed to learn to let Kip lead." Then in the resources section she listed a couple of books by author/homeschooler Debi Pearl who wrote Created to be His Helpmeet. Mona Lisa endorses the book by saying that she thinks every engaged or married woman should read it.I've read excerpts from Created to be His Helpmeet, and I found Pearl's take on husband/wife relationships alarming. One of her main ideas is that God has certain characteristics, and each man is born with one of these characteristics as his primary one. The characteristics are dominant, visionary, and steady. A wife's job is to discover her husband's primary characteristic and support him in that.In regards to the dominant husband, Pearl says this: "If you are blessed to be married to a strong, forceful, bossy man, as I am, then it is very important for you learn how to make an appeal without challenging his authority. "Also: "If a wife learns early to enjoy the benefits of taking the second seat, and if she does not take offense to his headstrong aggressiveness, she will be the one sitting at his right side being adored, because this kind of man will totally adore his woman and exalt her. "Debi Pearl, Mona Lisa Harding, and some other Christian, homeschooling moms I've come across are admirable for reading the scriptures and trying to apply them. They take the scripture from Ephesians where Paul says, "Wives, submit to your own husbands, as unto the Lord" and try to really make that happen in their lives. It's wonderful to try to follow God's word.That being said, I'm a Christian. I believe in the Bible. But I don't believe Paul's counsel, as interpreted by so many, is a blueprint for the way God wants marriage to be. I believe God created men and women to be equals, in marriage and life in general. I believe the Hardings have a good marriage, but I don't think having the wife submit to the husband is the key to their good marriage. I think all marriages get better when husbands and wives work together as completely equal partners. (I know I have a unique perspective on this issue because I'm a Mormon. We believe in eternal marriage and that the title of God can refer to Heavenly Father and Heavenly Mother--a coequal, exalted man and woman. In traditional Christian theology, it only makes sense for men to be created in the image of God because God is strictly male. In Mormon doctrine, there is space for women. They were not created as less than men, second to men, or subservient to men. They were created in the image of God just as much as men because God is also female. So my belief in this doctrine hugely shapes my belief about how men and women are meant to relate to each other. )Like I said, I admire people like Kip and Mona Lisa Harding for following the scriptures to the best of their ability and taking their faith seriously. They have done and will do so much good in the world for being people of integrity. But it really doesn't help anybody to see one gender as subordinate to the other. And I don't believe that's what God intends for us. I have mixed feelings about this book. It was very intriguing to read about their family's experience, but I was surprised to see that when discussing how other families could pull off a similar goal, they completely failed to mention options such as online college courses and, more importantly, CLEP exams, which allow you to earn 3-6 credits for the mere cost of ~$90 for the exam and whatever study materials may be needed. They touted the idea that going into debt for college was an acceptable price to pay, which is a viewpoint that I think needs very careful consideration. Options such as CLEP would allow for cutting financial corners when pursuing a degree, which I firmly believe is important in this economy. Speaking of which, they didn't even bring up the idea that there are options other than traditional college degrees - aapprenticeship, such as programs like Praxis or coding boot camps, etc. A degree is not what it once was, and I think that it would be wise to view other options as well.My other qualm had to do with the resources they list in the back of the book, such as books by the Pearls and Duggars. I have no issue with large families - I married into one - but these particular families also espouse a very legalistic form of religion that has harmed many, and while the book as a whole did not leave a bad taste in and of itself, their recommendations did. I knew there would be the Christian overtones in a book like this. It is pretty much a given when you hear "family of 12 and homeschool" in the same sentence. I was not prepared for the you-aren't-preparing-your-child-for-life-if-you-aren't-forcing-religious-doctrine-down-their-throat- Christian overtones. (Note: According to the Hardings, your child will most likely be evil if they don't 'let our lord jesus christ into their heart.) Nor was I prepared for the 'back door' method of getting your 12 year old child into college. I got the impression that this family was proud of their scheming to trick colleges into letting their kids go to school there. I don't want to fudge my child's transcripts to get them into college faster. I don't want to lie and trick colleges into letting my child take classes. Doesn't seem very Christian if you ask me. Unless you are looking for 'back door' methods of pushing your child to go to college I would not recommend this book. There is no good information for homeschooling, at least nothing that you can't get online or from normal common sense. This was a really interesting and easy read. I was surprised to see so many lackluster (and even hostile) reviews of this book. I felt the tone of the book was never prescriptive (you must do life out way to be good parents), but very down to earth. From the beginning, the authors stated their Christianity, their conservativeness, their desire to homeschool their 10 children, and that they don't have geniuses. They homeschool year round, allow the children to determine much of what they study (unschooling), and their first 7 children have started taking college courses by age 12. I didn't agree with everything they said or all their methods, but I felt I was able to take away some good ideas. One chapter is even devoted to non-homeschoolers, which I felt added to the like ability of the book. Education should be personalized for each child. Usually homeschool is the easiest way to accomplish that goal. Homeschool will look different for each family (hence the personalization), and homeschool isn't always an option. That was the meat of it. Recommended. A book worth reading for all homeschooling families or those wanting to. However...The book leaves a lot out and although it does say it isn't a how to manual I wonder what is the point of writing it at all if not to be a how to manual? 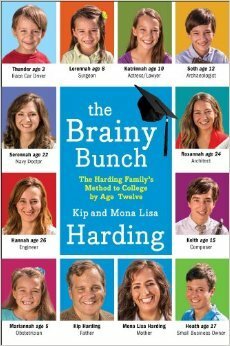 The story of the Harding family is easy to find, a book from their mouth should have more depth IMHO. For example the mother states more than once to use "real" books not textbooks for high school science, even saying as much as using university level real books, but at no point in the book does she elaborate on the difference between a Real book and a text book at that level. Basically you could read the book to know it is possible to get your kids in Uni by 12 or you could just take her word for it that she says it is and has actually done it and skip reading the book. The book did give me some confidence so it got a few stars for that. Overall I think it opened more questions than it answered. This book could have been summed up in a single paragraph: Tackle the Three Rs, go deeper as your child needs it. Follow their interests and surround them with resources and opportunities related to these interests. Find opportunities and loopholes to get your home educated child into college classes in a way that suits your family's needs. I don't know what this book was. Memoir? How-to? Brag book? Printed blog? Rambling? Train wreck? It was a bit of everything. Let me start by saying that I began college at age 16 and I did just fine. I am now a homeschooling mom whose oldest will start earning college credits (in math) at age 12. I understand the philosophy of letting kids spread their wings & aim for the stars. I agree when they say that average kids can go far when you let them move ahead at their own speed. I agree with the roots of what they are aiming for. Totally agree!But wowza, I don't agree with the pressure they put on their kids! On one page they're lightheartedly saying that the kids can move at their own pace & it's all good. Then the next page they're drilling their 8-year olds to pass the ACT.The contradiction through the whole book was enormous. They mock public schoolers for having a hectic morning schedules, then a few pages later brag about how their early-teen child copes well with getting up early to catch rides to college. Like that's any different when we're talking hectic mornings? And one page they're saying how play is so important for kids, but then a few pages later says all play must be regulated because kids shouldn't have free time & they better not even THINK of picking up a fun book from the library! Only educational books. Period. This family focuses on education at the insane cost of everything else. All through the book they talk about the importance of keeping kids home from public school so that YOU can raise them (they're only young once! ), but then in reality they ship their kids off to live on a college campus at age 15! Egad!! !This family is over the top. While I don't agree with letting kids fail in public school on the one side, I don't agree with putting insane pressure on the kids & shipping them out either! There IS a happy medium (my kids are living it!). One other thing I noticed. They talk A LOT about the kids getting degrees as soon as possible. At all costs--go broke if need be, but get a degree!!! Everything is focused on the kids getting a degree young so that they can get media accolades, but almost nothing is said about the obvious--why do you get a degree? To get a JOB. These kids all have amazing degrees by the time they are 18. And what do they do with the degrees? Ummm they go get more degrees. The only job they are capable of doing is learning & there isn't much of a market for life-long college students! The only kid who found a job only worked part time & then gave it up shortly later to go get another degree. In the end, these kids have a lot of knowledge & zero ability to get a job. If there was ever an argument for vetting a book on Goodreads rather than picking it up on a whim at the library...Here's what the book description doesn't tell you: The Hardings are part of the Quiverfull movement, devoted to having as many children as possible -- good Christian children who will go forth and spawn more good Christian children. They turned to homeschooling in part for 'religious reasons', which I suspect translates to 'the school didn't teach Creationism'.Now, my point here is not to criticise their belief system. Considering that I'm a queer-unmarried-living-in-sin-non-Christian-liberal feminist, it kind of goes without saying that we're not on the same page. My point, rather, is that this is a fairly useless book if you are simply curious about homeschooling. I don't have strong feelings about homeschooling, one way or the other (it seems to have pros and cons, and to work better for some families/students than others), but...well, if I'm going to read an argument for it, I'd rather read something with actual research. Facts! Statistics! Not just anecdotes and Bible verses.They seem happy with their methods and outcomes, and I won't quibble with that. I will point to a few things, though: first, the Hardings complain about some universities requiring higher ACT/SAT scores from homeschooled students. On one level, it makes sense that homeschooled students should be held to the same standards as traditionally schooled students. On another level, though, universities have fewer (quantitative) metrics for homeschoolers. Even if you can trust that those students earned their 4.0, that doesn't mean they're set for university learning. The Hardings' argument is that their children earn A grades because they stay on a given topic until they understand it completely -- and while that seems reasonable (and in many respects a good way to learn), it's also true that most university classes don't operate that way. You don't get infinite do-overs in college. Of course admissions offices want to have a reasonable assurance that incoming students can do college-level work at college pacing.I don't have a great sense of the value of the educations these kids are getting, either in the home or out of it (though, frankly, I do think it devalues the older kids' accomplishments to name jobs, rather than aspirations, for the younger kids on the front cover). In terms of the value of the book, though...well, let's just say that any insightful nuggest are lost in a sea of poor structure and religious proselytising. Setting aside many of the absurdities of this book, I have to say that the main ideas are good. Children do prosper when lessons fit their strengths and interests, homeschooling is less wasteful of time and resources, and it really is beneficial for families to spend time together. Those are all great points and why so many homeschoolers excel.Now, as for the rest of the ideas presented in this book, well, they kind of miss the mark. The parents claim that their children are intellectually ready and mature enough for college by the age of twelve. I really don't think that a child can relate on the same level as their adult peers. It is very naive. Not to mention that the professor cannot be responsible for watching a child student in the same way that a public school teacher would be. It's dangerous- even though these parents claim to know what their children face in class and on campus, but how could they? Especially if their child is going out to dinner with college friends. That too seems inappropriate. But they want their children seen as college students and not the children that they actually are (example, not letting a ten-year-old perform in children's theater because it isn't at the college level). They even seem to poke fun at professors disliking the use of certain internet sites in research papers, which in reality should never be used in academic projects, and still suggest and assign their children to look this or that up on the internet. That's not really teaching unless they are using academic databases and credible sites, which they aren't.My biggest problem with their ideas and involvement in the Quiverfull Movement is that they rely on having older children as babysitters and bread winners. If your dual-enrolled son has to get a part-time job to put food on the table while your unemployed husband spends his time completing his own degree then your previously stated priorities are off.Even though this book has it's problems it is still a quick and easy read. Just don't buy this one. Check it out from the library instead. I was looking through the homeschool books at the library and this caught my attention. I had never heard of this family but my daughter was JUST asking me the other day how it was possible that Doogie Howser became a dr. so young, so I brought it home. I was surprised to see so many negative reviews here along with statements about their Christianity. Of course they're going to credit their faith with their ability to pull off this kind of lifestyle. It's their faith, it's what drives and motivates them. So most of these comments are unfair. I think they sound like a charming, light-hearted family to be truthful. It's easy to attack what we don't understand, so I'm just going to take the stance that, while I don't agree with all of their methodology, I'm in no position to critique them.That being said, there are a few problems with this book. First of all, it got verrrrry repetitious as she was recounting all the kid's academic journeys. That was more or less half the book. I had to start skimming over some of it. The narration flips back and forth between the husband and the wife, so they have to keep pointing out which one is 'talking.' Maybe it's just me, but it's confusing and irritating when the speaker changes several times over within the same chapter. Also, this book was all over the place. Some chapters I didn't even understand what the subject was. There are several chunks that look like they were just shoved in for no logical reason. It's an inspirational read in the sense that it shows what kids can do when they're given the green light, so I don't feel like I wasted my time. I am glad I didn't spend any money on it though. 2.5 starsWhile I appreciated the Harding family story, this book felt too long for the little amount of generic homeschooling information that was given. I recognize that this was their personal journey and I could see the deep thought the parents put into their schooling decisions, but I'm not sure I believe such a truncated high school educational experience is the wisest course of action, generally speaking. I worry that by specializing our children so young, other ideas and opportunities become closed to them.I will give the Hardings this praise: not only did they avoid the abuse of exclamation points that so many home-educator memoirs contain but they also came across much less religiously legalistic than I feared. However, they still endorsed books by the Pearls AND Joshua Harris's ridiculous "guide book" on romantic relationships called I Kissed Dating Goodbye. The first has repeatedly been linked to instances of child abuse, and the second has led many to unhealthy sexual relationships and expectations. So, despite my faint praise, the Hardings are still a little to "Duggar" for my tastes. Not the best biography, but not the worst. I liked the family but I felt that a lot of the way they went around to get their kids in college (like their high school transcripts for example and just filling in that they had done the subjects) wasn't the most ethical of ways. Which was funny considering how the strong Christian values they hold. Also they were able to get their kids in college so early because they were always others kids around to help watch the younger ones. That didn't sit well with me. Not sure if I would have wanted to be in college by twelve but it works for them so that's fine. I did like the message of what the mom said though, always encourage your kids to learn and if they ask a question, don't just simply answer it but let them try and figure it out themselves. I do like that learning philosophy. It was just the rest of the book that was all "meh". This book is about a homeschooling family that has had their children so far all attend college at early ages and graduate and start careers early as well. The method can be easily summed up - discover your child's interests early on, encourage them to pursue their interests while somehow filling out a high school transcript, find a state in which you can take HS equivalency exams at a young age, find a college that will accept your kid!Some smart ideas, but also a LOT of repetition and some extreme religious view-points. Also, did anyone else notice that the phrase "to this day" (which is annoying and doesn't make much sense) was used in most of the kids' essays which were included in the book? Hmmm....I'm not quite sure what I think about this book. The Harding family is definitely to be applauded. Ten kids, home schooling, many military moves, six children who've started college by age 12 - it's exhausting just reading those words! :) On the other hand, it seems that some of the moments in their children's education were accomplished by "working the system" - testing the kids early, etc. There is definitely a lot of give and take in the family. The family definitely holds opinions that I would not agree with, but they are definitely to be applauded for their dedication and accomplishments. A good book. It lays down a decent plan for a homeschooling parent to follow. It is not a step by step program, but it gives you an idea of what to reach for. I felt very much like I was just listening to another mom tell me her story while reading. I enjoyed hearing their family story but felt that a lot of information was repetitive and unneeded. Overall I'm happy to have read this and have new ideas I go forward with homeschooling our 6 children. This is an interesting book but the information inside could probably be summed up in a long article. As such, the book became repetitive. I did enjoy hearing the Harding family's story and the educational achievements of their kids are impressive. If one were to homeschool, this would be a very helpful read. Even for non-homeschoolers, the Hardings make some good points and suggestions that can apply to students going through public or private schools. I had to look a second time at the title. The first time I misread it. You have done something that a lot of people should do. Our educational system is in need of help. You brought religion into the your system, with the Lord anything is possible. Great job. Great book! As a homeschool parent, I have been searching for the disconnect between school curriculum and unschooling. I felt that both were at the opposite sides of the pendulum. This is the balance and puzzle piece that places them together. Thank you! This is a great read for those who are considering homeschooling or just interested in finding out more about what one family did and how it was successful for them. It's not a how-to book, but it is definitely inspiring, encouraging, and informative! I feel conflicted about the material in this book. Though, it was a quick read and provided insight.